'Furious Love' is an eclectic spiritual partnering of eight on-fire-for-God believers who are willing to "turn everything upside down in the church to be as unlike the world as absolutely possible." Spanning the globe from Kosovo to Bangkok, Russia, Mozambique, and inner-city USA, each writer has a unique story of their furious love for God as manifested in their lives. Through humorous stories, intelligent commentary,and real-life miracles and healings, the culmination of the distinct voices and callings of these men and women range from witnessing to a blood-drinking witch, confronting Buddhists with machetes, prostitution and gay bars to lecturing at Cambridge University, experiencing victorious spiritual warfare, planting underground churches, and witnessing people being raised from the dead. Furious Love reveals God's wildly exciting plans for any who want to know Him inside out. 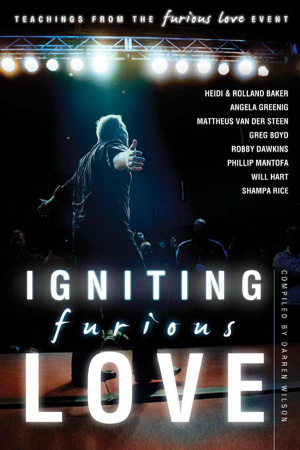 Igniting Furious Love by Darren Wilson was published by Destiny Image in January 2012 and is our 26739th best seller. The ISBN for Igniting Furious Love is 9780768440690. Be the first to review Igniting Furious Love! Got a question? No problem! Just click here to ask us about Igniting Furious Love.